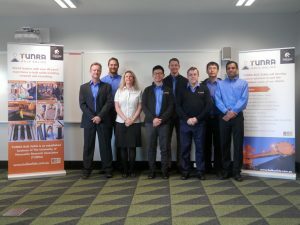 The University of Newcastle Research Associates (TUNRA) is driven by our core commitment to advancing industry through our provision of access to the latest researched solutions to industry issues. We leverage the research outputs of the University of Newcastle (UON) for the benefit of our commercial and industrial clients. We have been hosting conferences, seminars, and workshops, lead by subject matter experts including globally-recognised academic leaders, for more than 40 years. By using an organisation-led format, company’s can provide teams with equitable exposure to the latest in technology, applied research and innovations that can improve a company’s production-line, performance, and safety. TUNRA conducts in-house training sessions and conferences that are designed to directly address industry needs and no two programs are ever the same. Our courses, presentations, and workshops can be developed according to the specific issues being faced by the company. 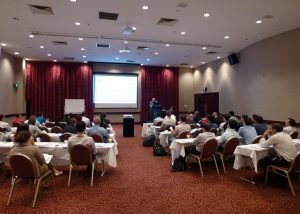 Our most recent offering was a collaborative learning and team conference day, hosted for resources company, Glencore at the UON Upper Hunter Tertiary Training Centre in Muswellbrook in September. In the lead-up to the Glencore conference TUNRA Bulk Solids Manager, Dr Tim Donohue worked closely with the Glencore team to identify their requirements and outcomes; how their time would be best spent with the TUNRA Bulk Solids consultants and engineers to best address service and productivity issues experienced on the ground. TUNRA’s research links to UON gives us a distinct advantage in formatting industry-leading education sessions. Opportunities for industry insight into future research priorities to continue to address global mining and processing issues. Strong value in that conferencing and in-services incur a set fee for a group of attendees, based on capacity and content required. Your company might benefit from a tailored conference and team-building day. Get in touch to discuss your needs and how we can accommodate them.